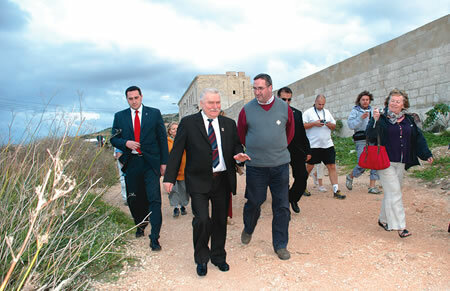 The legendary strike leader of the Solidarność (Solidarity) union movement and former Polish president Lech Walesa was the surprise actor in a Polish production currently being filmed in Malta. Yesterday, the 64-year-old Polish figurehead was playing his part in the romantic comedy Don’t Lie, Darling, filmed in Malta and Krakow, Poland and directed by Piotr Weresniak. Its lead actors are Piotr Adamcyzk, Beata Beata Tyszkiewicz, and Marta Zmuda. He was caught on location at Ghajn Tuffieha, where the film crew was shooting the breathtaking scenery from atop the Riviera Martinique. The film production was brought over to Malta by Polish consul Krystyna-Maria Mikulanka and other locations will include Derek garden centre in Qormi, and the Upper Barakka in Valletta. Lead actor Piotr Adamcyzk played the role of Pope John Paul II in the film Karol, un Papa rimasto uomo directed for TV by Giacomo Battiato and starring Raoul Bova. Walesa was born in 1943 in Popowo, Poland, to a carpenter and his wife. He attended primary and vocational school, before he left home at the age of 16 to become an electrician. He then went to Gdansk and joined the Lenin Shipyard, quickly becoming involved in an illegal strike committee. He was awarded the Nobel Peace Prize in 1983, and in 1990 was swept to power as the country’s post-communist president. It had been a difficult campaign. Walesa was accused of having worked for the communist police by spying on fellow dissidents in the 1970s, and although he was cleared of the charges in August, many Poles remained shocked by the allegations.